Woo! This Weekend! Emerald City Comicon! Friends, Romans, Sheldonistas: Lend me your ears! 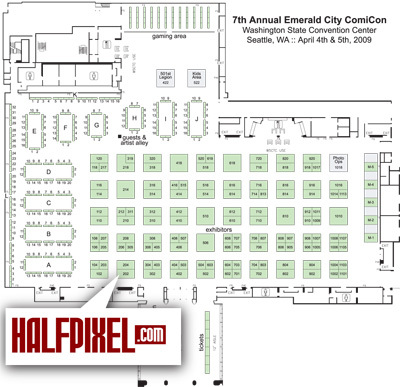 One of the best conventions in the U.S. is upon us once more: Seattle's very own Emerald City Comic Con! Last year I had just ridiculous amounts of fun at this convention: As it turns out, Seattle has the highest per-capita number of Sheldon readers of ANY city in the U.S., and it showed. Last year, we sold out of all Sheldon books super quick. But people still kept comin' by for their complimentary high-fives and free sketches. The convention was so much was so much fun...and the people of Seattle could not have been more welcoming. This year, I'll be exhibiting once again with my "How To Make Webcomics" co-authors at the Halfpixel booth (#202). I'll be there both days, and will be signing books, giving out free sketches, high-fivin', and just generally being goofy. I'll be bringing along Sheldon Original Art for sale at $25-off the normal price...so if there's a specific one you want to get, make sure you e-mail me). Also, here's a rough 'n ready map showing where I'll be: Booth #202, right inside the front door. You can't miss it: Just look for the two giganto-red "Halfpixel" signs. If you're in the Pacific Northwest, make plans to be there! Appearance Added: "Free Comic Book Day!" On May 2nd, I'll be signing, sketching, chattin' and high-fivin' at Metropolis Comics in Bellflower, CA, along with my good friend David Malki of Wondermark fame. May 2nd is "Free Comic Book Day", so it should be a fun madhouse.